Corruption is the root of all evil and not only brings the profession of Traffic Law Enforcement into disrepute but also the families of those making themselves guilty of this deplorable crime. This was the core message a number of speakers voiced at the Pass Out Ceremony of twenty-seven traffic officers from the Nelson Mandela Bay Municipality, O.R. Tambo Municipality, Ngqushwa Municipality, Mhlonto Local Municipality, Ingquza Hill Municipality and the Enoch Mgijima Local Municipality collectively. 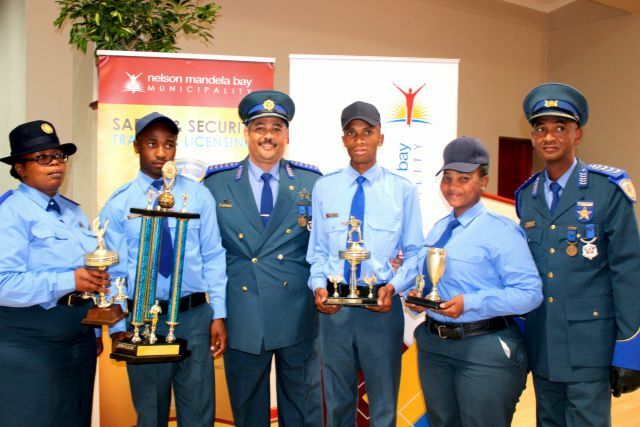 Nelson Mandela Bay Municipality Senior Traffic Officer Eric Tiso warned the recruits not to connive with criminals. "We have lost many of our colleagues because of corruption. This uniform must not be on TV for corruption. A bribe is not worth your career, your family, the respect of your community or your freedom,” Tiso said. Referring to a recent hit and run incident when an alleged drunk driver killed a Traffic Officer, Provincial Traffic Spokesman Charles Bramwell brought the harshness of the incident home, when he mentioned that the deceased graduated at the same college only last year. "Most of our people die on the road due to erratic driver behaviour. This is not just a job that anyone can do. You require passion and dedication to make a career out of it. "Your journey will be dangerous and full of curves and potholes. Do not be fooled. You are entrusted with the important responsibility to serve and protect. Have the courage to withstand unethical behaviour. "Traffic officers must be loyal, dedicated and uphold the image of the profession. The public expect good behaviour and road users must be treated equally. You must be visible and be ambassadors for your respective departments and country,” Bramwell, Eastern Cape Deputy Director for Traffic Control, added. Previously known as the Port Elizabeth Traffic College, the facility had humble beginnings when it was started in Korsten in 1995. It later moved to its current location in Greenbushes and is now one of only fourteen fully accredited traffic colleges in South Africa. Nelson Mandela Bay Municipality Director of Traffic and Licensing Warren Prins congratulated the new recruits and their families and said that today is only the start. "There is no easy way to success. Continue to learn and when the opportunity arrives, do not hesitate. Continue to keep knocking on doors to improve your life and it will open for you. "We need highly capable and knowledgeable staff and you have it within your grasp to become the excellent calibre of Traffic Officer we require,” Prins said. Maqhina Siniko walked away with the top honours in fire-arms training, Khothunyawo Mpendulo excelled in legal subjects and his general academic subjects while Wendy Sokhanyile received a prize for being the best student from Class 2 in 2017 overall. The duration of the course is one year. Those interested in the traffic course can contact the Nelson Mandela Bay Traffic College at 041 390 4500 for more information. Issued on behalf of the Nelson Mandela Bay Municipality by Media Management Officer Kupido Baron (082 780 2726 / 041 506 1500 / kbaron@mandelametro.gov.za/ @kupidobaron).